Toyota Motor Corp, one of the world's largest automakers, and Japan's space agency said on Tuesday they had agreed to cooperate in developing a manned lunar rover that runs on fuel cell technologies. 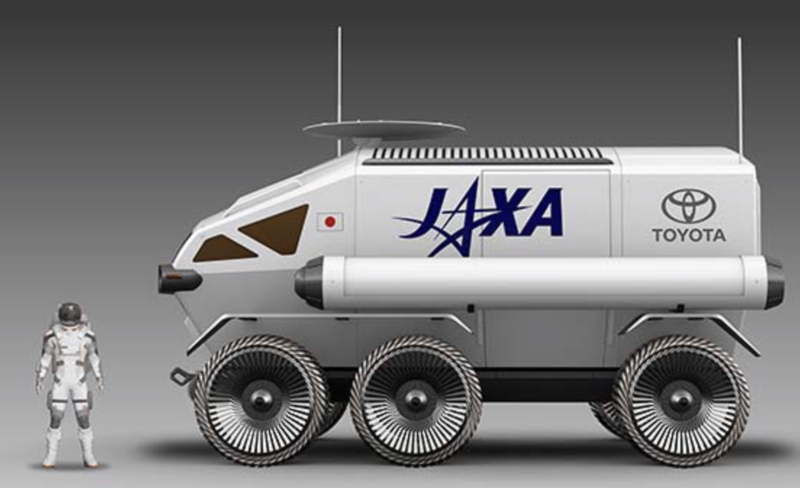 Although Japan has no plan currently to make a manned rocket that could send people into space, the rover could be a major contribution to an international space probe program in the future, the Japan Aerospace Exploration Agency (JAXA) said. The rover "will be an important element supporting human lunar exploration, which we envision will take place in the 2030s", JAXA Vice President Koichi Wakata told a symposium in Tokyo. "We aim to launch such a rover into space in 2029." The rover is still in the conceptual stage, but an illustration in the news release showed a six-wheel vehicle that somewhat resembled an armored personnel carrier. A spokesman for Toyota, which plans to ramp up fuel-cell cars as a zero-emission alternative to gasoline vehicles, said the project would give the company a chance to test its technologies in the moon's harsh environment and improve them. Toyota Executive Vice President Shigeki Terashi stressed the excitement that comes with taking part in a space project. "As an engineer, there is no greater joy than being able to participate in a lunar project by way of Toyota's car-making," Terashi told the symposium. "Being allowed to be a member of 'Team Japan', we would like to take up the challenge of space," he said.